Preheat the oven to 200°C, gas mark 6. Line a shallow 23 x 32cm Swiss roll tin with baking parchment. To make the sponge, place the eggs and sugar in a large bowl and whisk with an electric mixer for 6-8 minutes until very pale in colour and thick enough to leave a trail on the surface when the whisk beaters are lifted. Tip the flour into a sieve and sift over the whisked mixture. Fold in using a large metal spoon, cutting through the mixture until all traces of flour are gone. Using the back of a fork or spoon, crush 125g of the raspberries then gently fold them through the mixture, so that they are evenly swirled. Pour mixture into the tin, spreading evenly into the corners. Bake for 10-15 minutes, until the cake is firm to touch. Turn out onto a clean sheet of baking parchment sprinkled with a little extra caster sugar. Peel off and discard the old baking parchment and roll up the Swiss roll, beginning at the short end and using the baking parchment to help you so that the cake is completely enclosed in the paper. Allow to cool. When cool, unroll the sponge and spread with the raspberry conserve, spreading evenly and right up to the edges. Carefully re-roll the cake, using the paper to help. 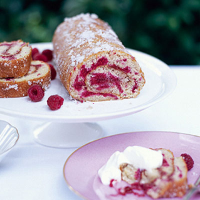 Trim the edges if required, transfer to a plate and serve dusted with caster sugar and the remaining fresh raspberries.